This Alaskan bush pilot inherited his great uncle’s callsign. The QSL is all his own. KL7DYS worked summers aboard the Kamilar, his late great uncle’s 70 foot Dungeness crab boat. Off-hours, Erik played off-shore Pacific Northwest ham radio, away from Washington State University, where he served as president of Cougar club station W7YH, one of the oldest collegiate ham stations in America. Now based in Juneau, Erik flies passengers and cargo all over the Last Frontier. And he landed long enough to get in touch with me for a custom QSL design to help communicate something of his young life and times and Scandinavian family heritage. As you might expect, we talked ships and planes. But in passing, for design inspiration, Erik mentioned Norwegian/Swedish folk-style decoration called Rosemåling, about which I hadn’t a clue and of which I was keen to know more. Might seem funny that hand-pained floral patterns from the Old Country could figure into Erik’s high adventure lifestyle. Who knew, eh? But once I got a look at the beautiful brushwork on antique wooden chests and bowls, I saw wind and waves and spray and clouds and snow in the billowing leaves and spiraling stems. And once I saw that, I got the idea for a casual family tree, referencing Rosemåling style, based on the Kamilar which Erik began his adventures, and the Cessna 207 he flies today, crowned by the call sign bequeathed by his late great uncle, the original KL7DYS. 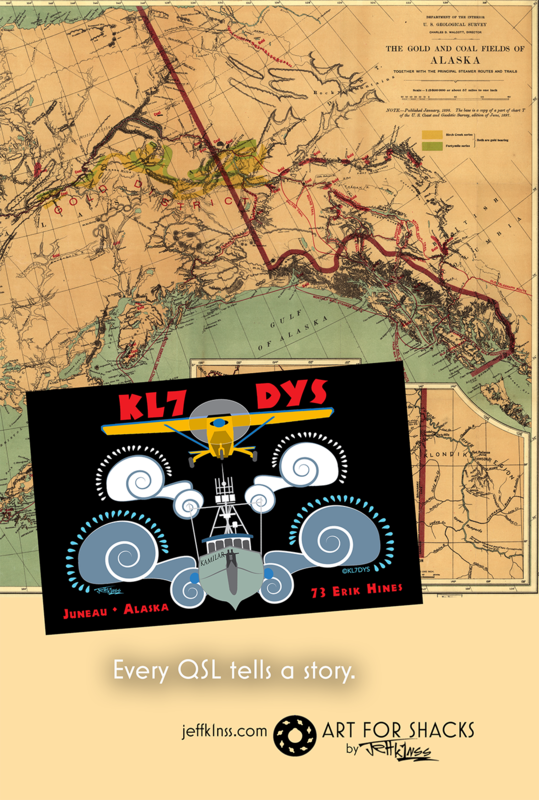 Maybe we’re not all Alaskan bush pilots, but all hams have stories and passions. And if I can draw something of yours into your next QSL card, you too will have something heartfelt that’s all your own – to share with the world, as well as a keepsake marking a fond moment of your life and times. Not a big deal, not a lot of money. Funny how things like that, in a very personal way, can in the long run mean a very great deal.